We didn't have any shoestring on hand, but we did have these really cool, extra long Twizzlers. They are over a foot long. They worked great. 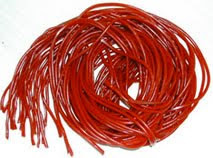 Take a large marshmallow and thread it onto the shoe string licorice. Just poke the licorice through and slide it down until it is just past half way. If it is hard to thread you can use a toothpick or small skewer to make the hole first and then slide the licorice through. 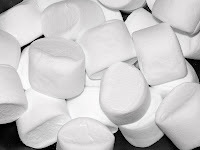 You will need a "marshmallow on a rope" for every person playing. Each player puts the end of the licorice farthest from the marshmallow, in their mouth. At the same time, without using hands, the players eat the licorice until they get to the marshmallow. Whoever eats the marshmallow first, wins the game. WHO'S USING THIS FOR FAMILY NIGHT? ACTIVITY AND TREAT IN ONE. HAVE YOU SEEN THE NEW EXTRA LONG TWIZZLERS? TODAY IS THE LAST DAY TO ENTER THE MATCHING TIE GUY GIVEAWAY!!! i have got to try this! and i have NOT seen that extra long licorice out here in Ohio, but I am hoping it makes its way out here!